Reference number for this case: 3-Oct-54-Annoeuilin. Thank you for including this reference number in any correspondence with me regarding this case. Flying saucers were seen in Ivory Coast. 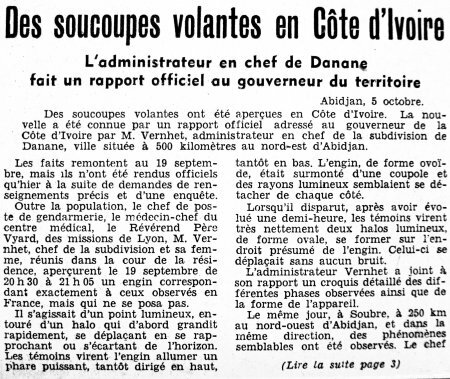 The news was known by an official report addressed to the governor of Ivory Coast by Mr. Vernhet, chief administrator of the subdivision of Danane, city located at 500 kilometers in the North-East of Abidjan. The facts go back to September 19, but they were made official only yesterday following precise information and an investigation. In addition to the population, the chief of the gendarmerie station, the chief consultant of the medical centre, Reverend Father Vyard, of the missions of Lyon, Mr. Vernhet, chief of the subdivision and his wife, joined together in the court of the residence, saw on 19 September from 08:30 p.m. to 09:05 p.m. a machine corresponding exactly to those observed in France, but which did not land. It was a luminous point, surrounded by a halation which initially grew quickly, moving while approaching or deviating from the horizon. The witnesses saw the machine light a powerful headlight, sometimes directed up, sometimes down. The machine, of ovoid shape, was surmounted by a cupola and luminous beams seemed to move on each side. When it disappeared, after having moved half an hour, the witnesses clearly saw two luminous halations, of oval shape, formed on the supposed place of the machine. The latter moved without any noise. Administrator Vernhet joined to his report a detailed sketch of the various observed phases as well as of the shape of the apparatus. The subdivision of Soubre confirmed the existence of the phenomenon which he witnessed. In the Territory of Belfort, Mr. Lucien Bourgeois, 58 years old, reamer at the DMC factories was Monday towards 06:45 p.m. in front of his dwelling in Grandvillars. Suddenly his attention was drawn by a sharp gleam in the sky, produced by a luminous machine of lengthened form which moved slowly towards the west. Mr. Bourgeois alerted at once several of his neighbors who managed, during half an hour, to observe this weird phenomenon. In the Moselle a 19 year old young man, Mr. Pierre Laplace, electrician at the Kuhlmann Co in Dieuze (the Moselle), saw Sunday evening at 08:07 p.m. a large luminous disc, of green color, at the level of the wood of the Brides, between Vergaville and Kerprich (the Moselle). The machine which emitted sharp gleams lands near Benestroff. About thirty passers by which had stopped on the road to follow the evolutions, formally confirm Mr. Laplace's statements. Several witnesses tried to go by motorbike towards the supposed landing spot of the craft, but then, the apparatus took height again and definitively disappeared at 9 p.m. In the Nord, a hundred people saw moving in the sky between Annoeuillin and Provins, Sunday evening, three "flying crescents", during 25 minutes. In Lyon, a journalist claims to have observed using a binocular, above the Sainte-Foy hill, an orange red luminous disc, followed by other brilliant, smaller discs. The phenomenon lasted approximately 20 minutes. A little everywhere saucers, cigars, discs, balls and other "flying" objects were seen, in particular in Chancelade (Haute-Vienne), Willer (Haut-Rhin), Gouesnach, close to Quimper, Bautignecourt, Ambazac (Haute-Vienne), Dijon, Marcoing, near Cambrai, Pommier (the Indre), Rouen, Ajaccio, La Rochelle, Quimper, Cholet and Vannes. Lille, October 5. -- A retired miner, of Beuvry-les-Béthune, known as a prankster, did not miss the opportunity the flying saucers offered to him, to have fun at the expense of the residents of the nearby localities. Inspired by the Montgolfier principle, the merry pensioner manufactured machines three meters in diameter. The envelope was made of strong gray paper sheets, carefully glued. At the base of the "saucer", there was a small receptacle in which a tuft of packing soaked with a flammable liquid rested. It was then enough to ignite the packing to see the machine rise and disappear with the liking to the winds, surrounded by yellowish and oranges reflections. It is after the discovery, close to a haystack in which one of these machines had almost set fire, that the gendarmes were brought to suspect the pensioner. In addition, many models of "flying saucers" were found at his home, prototypes which the inventor was getting ready to launch in the sky of the Nord. Anyway, the prankster will be sentenced for dangerous fun. More than 100 people, of Bauvin, Anoeuilin, Provin, localised at 20 km. from Lille saw "them". Mr. Gaston Lecoeuvre, a minor of Annoeuilin, tells: "Taking some fresh air on my doorstep, I see a luminous spot. Suddenly it turns, then, without noise, brilliant as a nickel coin, it seems to land, then sets out again at the end of 20 seconds." Mrs. Parzy, who holds the coffee shop of the place, sees 3 luminous objects. Mr. Bourbote, employed, states: "They evolved during 25'." The author indicates that on October 3, 1954, Gaston Lecoeuvre, a miner, observed from his doorstep where he smoking in the evening a kind of star which slowly fell. He first thought that it was a shooting star, but he was intrigued when he noted that instead of disappearing, the star continued its fall and took the appearance of a whirling disc, which landed in a nearby garden. Mr. Lecoeuvre rushed there and saw it was an approximately three high meters metallic disc shining like nickel. It was not posed on the ground but hovered motionless 10 or 15 centimetres above the ground. On its higher part, there was a small cupola but he saw no opening there. The witness approached within a few meters of this object while his dog barked with rage, possibly because ultrasounds emitted by the flying saucers according to Jimmy Guieu. Then the witness fled, frightened, to the Parsy coffee shop a 100 meters from there, were som ten people were drinking and playing pool. The witness took them with him, as well as other people, and a group of forty men, woman and children observed that the spacecraft had taken off meanwhile. Whereas the witness heard an odd whistling sound, these people looked up in the air and perfectly distinguished the spacecraft which was motionless in the sky in the direction of Provins, with two other shining discs which turned around it. It was now 09:00 p.m. The discs were at a 45° approximately angle compared to the horizontal, and slowly moved in circles, in opposite direction one from the other, at time showing nothing more of them than red dots. When they approached each other, the better displayed their reinflated aspect and their orange-red color. They continued these operations up to 09:10 p.m., they were also observed with binoculars passed from hands to hands, then the objects were seen disappearing behind a curtain of trees in the direction of Provins. Jimmy Guieu notes that in the numerous villages of the area and during 25 minutes, hundreds of people had also followed this "phenomenon." Michel Carrouges indicates that the Lecoeuvre observation was made at a distance of 4 meters, and that the saucer landed in the court or the garden where the witness was. 1 = "undulating" movement, oscillations "like dead leafs"
2 = emission or absorption of "satellites"
Godelieve van Overmeire indicates that in 1954, on October 3, in France, in Annoeullin (Nord), Gaston Lecoeuvre smoking outside saw what he mistook for a shooting star, fall into the close garden. Amazed he rushed and saw a 3 m height metal dome shining like nickel, posed on the ground, motionless. His dog barked with rage against this thing. Gaston Lecoeuvre flees, shouting, to the Parsy Coffee where consumers rushed after him. Much too late. The craft had already taken off with a whistling sound. It was not alone in the sky: two other brilliant discs whirled slowly around the first. It was then 21 hours. Godelieve van Overmeire indicates that the source is Jimmy Guieu: Black-out sur les S.V." - Fleuve Noir 1956 - p. 183. She adds that another version is: "IN REALITY: At 21. 30 the Moon lay down in crescent in the south-west. Optical illusion caused by a stratus layer", version which source is indicated as M. Figuet / J.L. Ruchon: "Ovni, Premier dossier complet..." Alain Lefeuvre 1979, pub. p. 657 to 660. 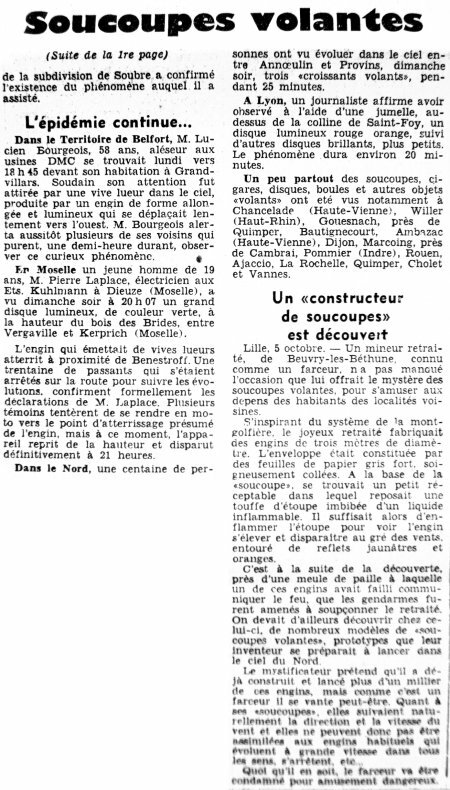 Luc Chastan indicates that in the Nord in Annoeullin on November 3, 1954 at 23:10 "Several witnesses undoubtedly gendarmes, observed during several minutes with the naked eye and with binoculars, an object in the shape of a red crescent which moved in straight line with stops while undulating. It could be very fast. Ther was emission of a satellite object." The website indicates that on November 3, 1954 at 23:10 in Annoeullin, France, "one object was observed for over four minutes (Boistelle)." In "Special notes" of their catalogue, the GNEOVNI group indicates that there exists in several books, such as Aimé Michel's "M.O.C. ", Planète publishers in 1966, in which there is a number of observation cases in the Nord and Pas-de-Calais which are not included in their catalogue because there "remains much doubts as to their credibility." One of them is noted "3-10-54 Annoeulin nord". Santos wrote that for this case #538, of landing, of October 3, 1954, in Annoeullin forty people and a dog observe a brilliant disc, posed during a few minutes in a garden. Dominique Caudron says that to 20:45, Annoeullin, 59, a witness and his dog (which barked) saw an object in the shape of dome seeming to be posed in a garden. Caudron indicates that it was in fact the Moon. Dominique Caudron says that to 20:45, about fifty people saw a luminous object rising with the top of a grinding stone. Caudron indicates that it was in fact the Moon. He notes that it should have been said it was an apparent landing, or else we have to admit that the Moon landed twice (in Ablain St Nazaire and Annoeullin), and that it followed two cars (in Rue and Hérissart). 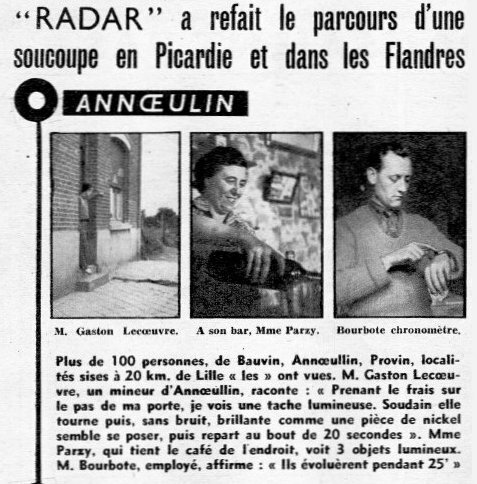 [ra1] Article in Radar magazine, Paris, France, October 17, 1954. [jg1] "Black Out sur les Soucoupes Volantes", book by Jimmy Guieu, Fleuve Noir publishers, France, page 183, 1956. [jv5] "Preliminary catalogue of 500 observations", listing in "Challenge to Science: The UFO Enigma", book by Jacques and Janine Vallée, Henri Regnery publisher, USA, 1966. [jg1] "Black Out sur les Soucoupes Volantes", book by Jimmy Guieu, Omium Littéraire publishers, France, pp 182-184, 1972. 0.1 Patrick Gross March 17, 2007 First published. 1.0 Patrick Gross January 9, 2009 Conversion from HTML to XHTML Strict. First formal version. Additions [go1], [ud1]. 1.1 Patrick Gross March 8, 2010 Addition [lc1]. 1.2 Patrick Gross March 14, 2010 Addition [mc1]. 1.3 Patrick Gross June 3, 2010 Addition [la1]. 1.4 Patrick Gross June 21, 2010 Addition [jv5]. 1.5 Patrick Gross July 7, 2010 Addition [gn1]. 1.6 Patrick Gross October 14, 2016 Addition [dc1]. 1.7 Patrick Gross February 2, 2017 Addition [ub1].